With your precious time and with your sweetie by your side, wouldn't you like to know that you won't have to worry about babies screaming during your candlelit dinner? Would you like to enjoy the swim up pool bar without worrying about a teenager splashing water in your drink? 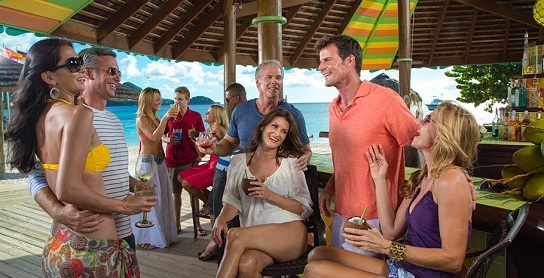 Resort companies like Sandals Resorts and Secrets Resorts are expanding. Large resort chains like Iberostar and Riu are jumping on the bandwagon. You now have more choices than ever and we predict your choices will continue to grow rapidly. We now offer about 90 different all inclusive properties that are for adults only. 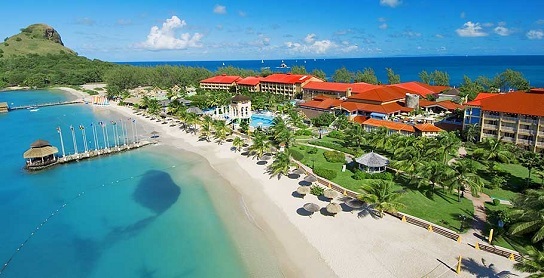 #1, Our top choice is located on one of the best beaches on the romantic island of St Lucia. Sandals Grande St Lucian also has breathtaking views, 12 restaurants, swim up rooms and even suites with private pools. #2 is on one of best beaches in the world, Maroma. Secrets Maroma Beach Riviera Cancun has 8 great suite categories to choose from and also has 7 restaurants and 7 bars. This resort is on every top 10 all inclusive resort list you'll find. Cancun and the Riviera Maya have so many adults only all-inclusives that we gave them their own page, Cancun Adults Only. Iberostar Grand Bavaro is the best and most luxurious resort in Punta Cana. We love that you have 3 Iberostar resorts next door to enjoy along with the casino and shopping area. The swim out suites are really nice and the oceanfront suites have a jacuzzi on your private balcony. Even the basic suite comes with butler service. Sandals Grande Antigua has an original section with classic Caribbean rooms and a new modern Mediterranean side with modern suites. With 11 restaurants, 7 bars, 17 room categories, this resort has something for everyone. Secrets St James in Montego Bay has a great beach and is very convenient to the airport in Jamaica. All rooms are junior suites or bigger, have whirlpool tubs and come with 24 hour room service. The 9 restaurants and 9 bars never require reservations and you never have to wear a wristband at Secrets Resorts.